Rub shoulders with celebs at this intimate luxe resort. Nancy is a Toronto-based freelance journalist who enjoys writing about the food and drink, culture, history and entrepreneurial spirit she comes across in her travels. Her work has been published in Bold Magazine, National Post, Vancouver Province and Toronto Sun. When oil baron Henry Morrison Flagler set out to build a luxury resort for the business tycoons of the Gilded Age, he had no way of knowing that Florida’s barrier island of Palm Beach would still be a playground of celebrities, royalty and presidents in the 21stcentury. During John F. Kennedy’s presidency from January 1961 to November 1963, the family compound on North Ocean Boulevard was dubbed the “Winter White House,” a moniker President Donald Trump appropriated for Mar a Lago, his Palm Beach estate. While many celebs own oceanfront villas, others stay at one of the many luxury hotels in the area. 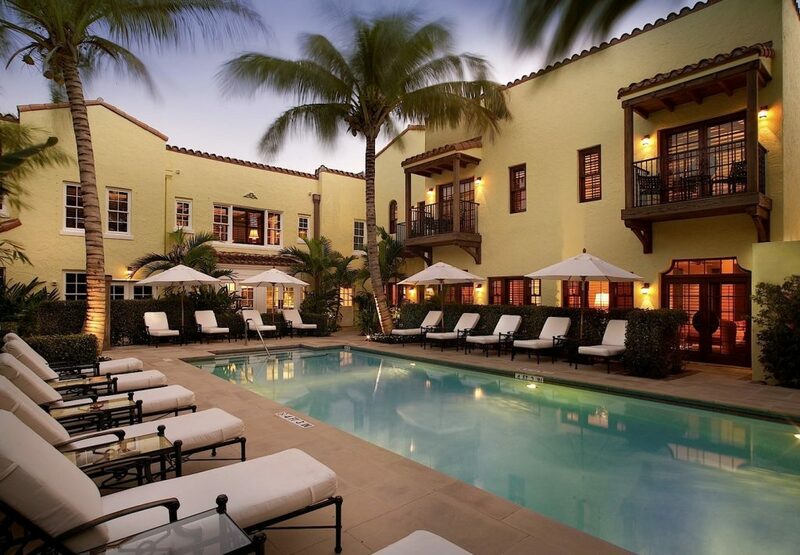 The Brazilian Court Palm Beach, tucked away as it is on a quiet residential street a short stroll from the Atlantic Ocean, top restaurants and shopping on Worth Avenue (the East Coast equivalent of Rodeo Drive in Beverly Hills), offers something most don’t—tranquility and anonymity. While the unassuming Spanish Mediterranean-style low rise sits discreetly amid neighboring upscale homes, its exterior belies the serene oasis at its heart. Brazilian Court, a member of The Leading Hotels of the World, put about US$45 million into a major renovation in 2009. Still, the rooms are constantly being tweaked. New wood floors and carpets went in 2017, and this past year all mattresses were replaced and new furniture pieces acquired. Improvements stay true to its original simple elegance sought by Gary Cooper, Greta Garbo, Marjorie Merriweather Post and Amelia Hearst, to name but a few of its famous guests. Built in 1926 and now a designated historic landmark, the hotel was designed by Rosario Candela, the architect behind many of New York’s most desirable apartment buildings. Photos of the early days found in the hallways, original glass-paned exit doors and an historic wishing well will whet your appetite for exploring the history of Palm Beach. The concierge can help you book a walking tour of Worth Avenue, or plan a visit to the nearby Flagler Museum, a 75-room mansion commissioned in 1902 by Flagler for his new bride. Or you could head to the historic downtown West Palm Beach. The hotel is a 15-minute drive from Palm Beach airport. Taxis, Uber and Lyft are your best options for getting from the airport to the hotel, or anywhere for that matter. Worth Avenue’s upscale designer shops and restaurants, as well as the beach, are an easy walk from the hotel. Other spots, such as The Flagler Museum or City Place in downtown West Palm Beach are 10 minutes away by bicycle, less by car. Don’t count on using local transit. It involves transfers and, frequently, long waits. Brazilian Court is a favorite of affluent celebrities and socialites looking for anonymity. Not only is it steps from shops and restaurants, but it also has the luxury accommodation and top-notch personal service to which they are accustomed. 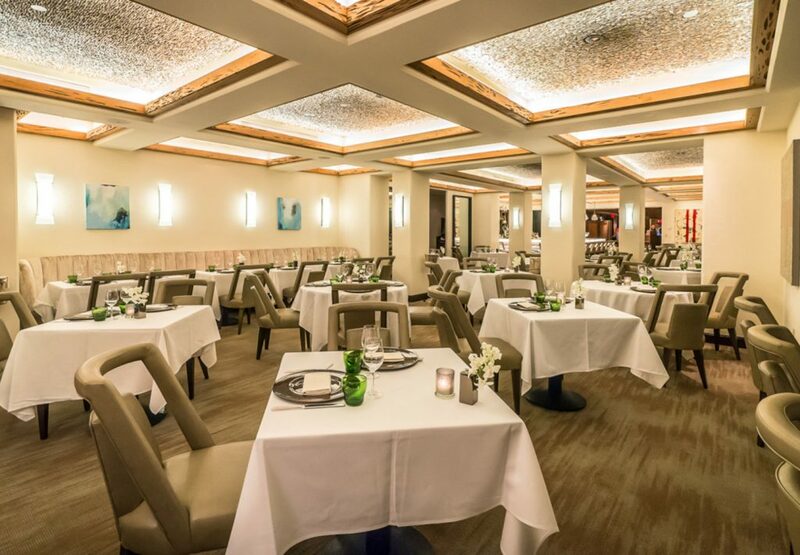 Try not to gush if you’re seated next to singer/songwriter Meghan Trainor, NBA star Michael Jordan or Hollywood legends such as Robert Duvall, Candice Bergen or Tommy Lee Jones at Café Boulud. The private-apartment style hotel underwent extensive renovation in 2003, resulting in 46 400-square-foot studios, and 34 one-, two- and three-bedroom suites, ranging from 700 square feet to an 1,800-square-foot two-bedroom lanai suite with two and half baths. In a nod to its glamorous past, a handful of large, elegant poolside suites bear the names of legendary A-list actors such as Ingrid Bergman, Fred Astaire, Katherine Hepburn and Marlon Brando. If you need to ask the price, you can’t afford to stay in one. A more modest 700-square-foot one-bedroom suite with a patio has a separate entertaining space and a private outdoor sitting area that looks on to the pool or one of two tropical courtyards. The living room is warm and homey, done up in quality imported fabrics and natural wood tones. Moss and gold accent pillows complement a wheat-colored fabric sofa and chair, while mahogany handcrafted crown molding, desk and coffee table, and Provence-style shutters add a sense of old world elegance. All the touches of home are thought of, from lamps and framed mirrors to plants and paperweights. A mini fridge, stocked wet bar, wine cooler and a variety of glasses let you end your day enjoying a cocktail or glass of wine on your patio before heading out to dinner. 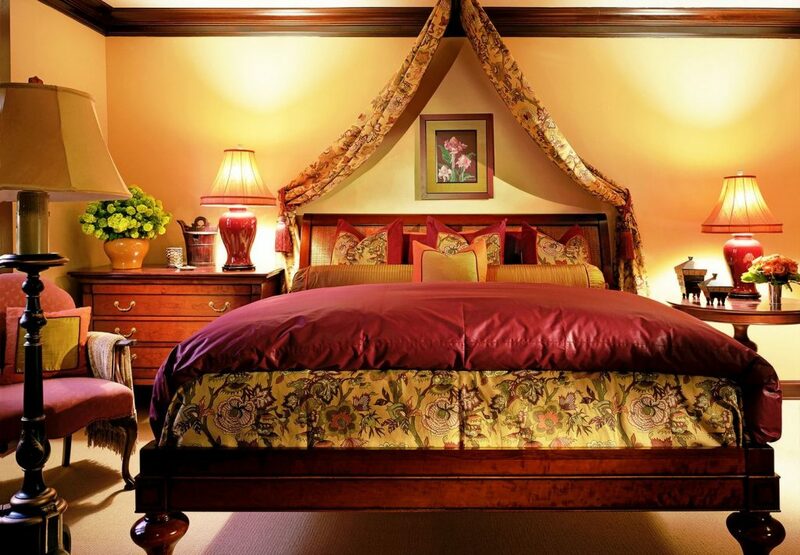 A mahogany king-sized bed, piled with pillows and cushions, and draped with imported linens in solids or floral prints of peridot, ruby and gold tones (set to be replaced with new Turkish linens later this year), is turned down each evening to reveal crisp white sheets covering a pillow top mattress. In a large built-in wardrobe you’ll find two plush white terry bathrobes, slippers, an umbrella and a safe large enough to hold a laptop. Complimentary high speed, secure WiFi and a copy of the New York Timesleft at the door each morning (a nice touch in this era of all things high-tech) satisfy your need for a daily news fix. Rooms also come equipped with HD TVs and DVD players. If you want coffee with your news, there’s room service available, though coffeemakers are available on request. The secret of Brazilian Court’s appeal is its serene spaces: the outdoor pool and hot tub and two inner courtyards where you can while away the afternoon stretched out on a cushioned chaise lounge, surrounded by lush tropical plants and fountains. Keeping up with your fitness regime is easy thanks to a 24-hour state-of-the-art fitness center with plenty of weight training and cardio equipment and the on-site bicycle rentals. Pick out a hot-pink Lilly Pulitzer-inspired bike with a basket at the front door and take one of several recommended routes around town or along the beach. Bicycle rentals are US$29 for half a day. Café Boulud Palm Beach, opened onsite in 2003, is a big draw. The French-American menu created by award-winning internationally renowned chef Daniel Boulud and executive chef Rick Mace, has made it a rendezvous for Palm Beach’s elite. The menu, which got a makeover in 2015, combines the soulful French traditional cooking that made Boulud’s New York restaurant famous with the flavor of South Florida to create such favorites as spiced mahi mahi with Key West shrimp and curry leaf, pan-seared scallops with brussels sprouts and miso jus, and Dover sole meuniere filleted tableside. Whether you’re dining in the restaurant or under the stars in the south courtyard, looking for a bit of lunch poolside or getting an early breakfast, you’ll find the menus chock full of healthy, light and innovative choices alongside comfort food—think Greek yogurt with berries and granola vs. mini Belgian waffles with apple-walnut compote, crème fraîche and maple syrup. In 2015, the restaurant got a new sleek, contemporary look that saw the bar move to front and center. 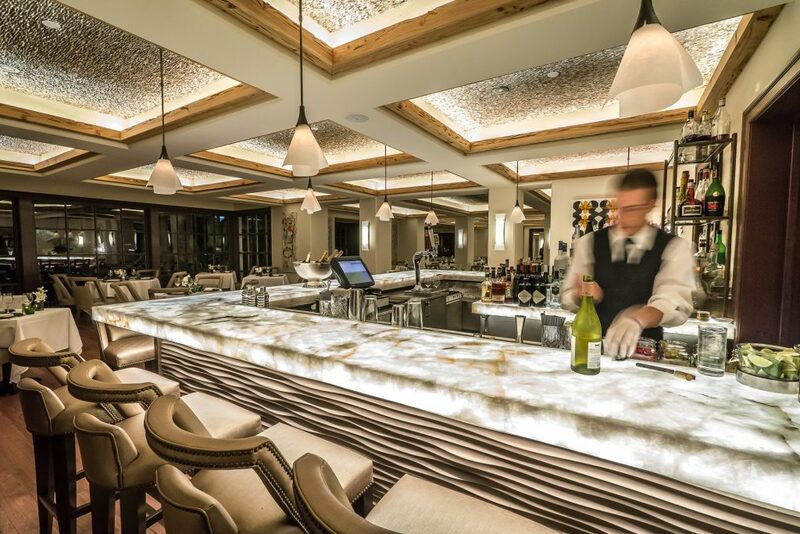 The marble-topped, dramatically backlit bar, with seating for 15, is a natural pre-dinner meeting spot. Look up to admire the cafe’s ceiling made of glittering shells and local cypress. The bar offers a broad selection of craft beers, wine and cocktails, including the oak-aged Old Fashioned cocktail made with Ketel One Oranje vodka and crème de cacao, a bright, flavorful twist on the original whiskey-based drink. The bar menu features dishes perfect for sharing: half a dozen Rappahannock Co. oysters from Chesapeake Bay or Florida calamari with Meyer lemon aioli and pickled pepper pair well with a cocktail or craft beer. For wine drinkers there’s a selection of house-made charcuterie or one featuring artisanal cheeses. Brazilian Court took the guesswork out of how to get set up on the beach. No need to schlepp a towel, sunscreen, water and magazines with you on a hot muggy day. 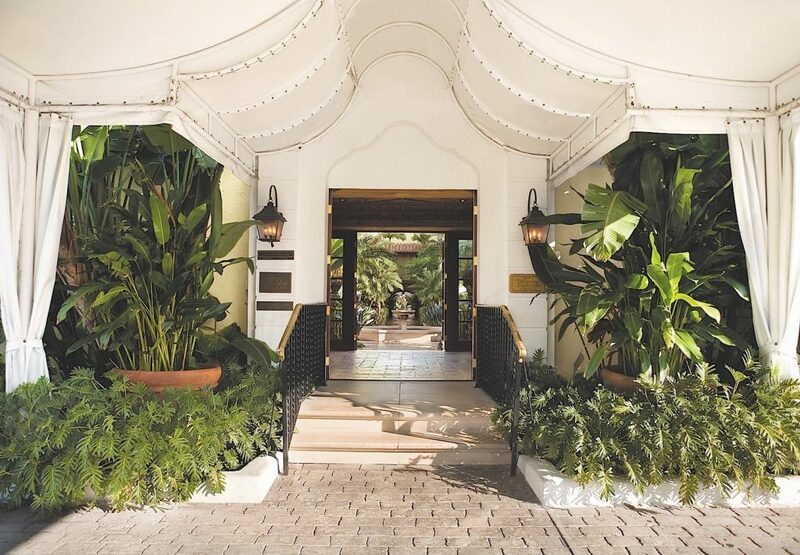 You can take advantage of the complimentary Palm Beach Experience. Give the concierge a heads up, change into your swimsuit and hop in the hotel’s Cadillac Escalade to be whisked two blocks to the beach. Well-placed beach chairs and umbrellas await you along with a beach bag stocked with all the necessities. It’s the little things that often matter most. If, like me, you prefer to use your cellphone as an alarm clock to ensure you don’t miss an early flight or arrive late to a power breakfast meeting, you’ll find the bedroom outlets difficult to figure out. I ended up charging my phone overnight at the wet bar and turning the volume up because when I flipped the master light switch in the bedroom it cut the power to the only free outlet I could find. We like when hotels have a dedicated spot near the bed to plug in our electronics. In March, we found prices for studios starting at US$763, but that drops by about half in October to US$359. If you want to check out another hotel in Palm Beach, see our review of The Flagler Club at The Breakers. Nancy stayed as a guest of the hotel. The hotel did not have editorial approval.